Is there Hope for Malthouse? Trump-like reverberations via social media has hit the fan with comments by Mick Malthouse. If someone ‘unknown’ was to say those comments he made in Ballarat about women’s football, then it wouldn’t have made much of a dint. Since premiership player/coach and media commentator Michael Malthouse said it, it will now have a profound effect. What that effect will pan out to be is what will make for interesting reading. It’s difficult to pass judgement unless one hears/reads the exact words he said. That said, his sentiment and opinion are definitely outdated as Hope made clear. He is certainly entitled to his opinion, but he has to own it. If you or I were to say that “my opinion is that disabled people shouldn’t be allowed car parking places” then we would be judged accordingly and no, “it’s only my opinion” will save us. Put in the wider context, it is another example of a male dominated industry and societal perception. It is the acceptance by Malthouse himself that he can say such comments, notions that he feels are normal in society. It will be the media and public who may (as history has often proven) fall into line and in turn, accept his views … because that is the status quo, the accepted belief. Or are we changing … me too? That is the narrative that is yet to fully unfold. The women playing AFLW and perhaps any level of footy, understand the risk and danger of this contact sport. They accept it and revel in the challenge of the game. They know that injuries are part of the game and accept their fair share. They do not play at the break neck speed of the men, nor do they jump as high or tackle as violently. They already apply a level of ‘moderation’ in their own game style. Bottom line is, they want to play Australian rules football – not a modified form of it. If they do accept the current continuous changes to rules and playing conditions, then they risk having their league turned into a hybrid form of the true game and will be labelled for it. Their status will be diminished as a different form of elite player or professional playing Australian Rules football. They want to play Test cricket, not 20/20. The Outer Sanctum ladies will have a field day with this one! They will go wider and explain how Malthouse’s comments are a continuation of the pervading sexist attitude towards women in sport. His comments are telling young girls and females in general, that they cannot play a physical game unless there are special rules in place. That they are not equal. There aren’t any Mick Malthouse’s saying such comments about women’s participation in rugby, basketball, soccer, hockey etc. There are no ‘special’ rules for women in these sports to ‘protect’ them. Malthouse also pulled out the grandpa card and explaining two of his granddaughters said the game was too rough. Yet he doesn’t acknowledge that there are perchance equally as many boys and men who also feel the same way and would neither step on a blade of grass nor any other sporting field. Mo walking off the stage did show some petulance. But she would have stood no chance of arguing the point with Malthouse or fellow male, Jason Akermanis, on stage. Listening to Akermanis corroborate the macho connection when he said she should have stayed on stage to listen to others and argue the point. I am yet to know whether he supported Malthouse’s comments or not. That fact that he didn’t reject his comments possibly suggests he agrees with him. Sadly, his style of reply was a put down to Hope that implied she didn’t have the guts to stay on stage. His response showed her minimal respect as an elite athlete trying to enhance herself, the AFLW and women in sport. She made a statement and the reason for that should be understood. 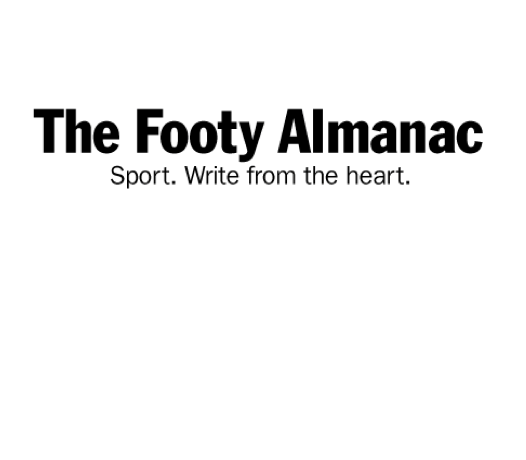 Read about The Women’s Footy Almanac 2018 HERE. Copies of The Women’s Footy Almanac 2018 are available for sale via our online store. Malthouse this morning on Offsiders explained that he feared for women’s safety playing AFL because at present there are twice as many concussions per head in the women’s comp. In 2017 Carlton captain Lauren Arnell said that a number of big injuries and collisions in the AFL Women’s competition can be attributed to players lacking experience when it comes to the physical side of the game. There is also scientific evidence that women are 2-5 times more likely to incur an ACL injury than men playing the same sport. Some evidence points to biomechanical differences as a contributing factor. When a person of Malthouse’s experience offers an opinion, Mo Hope’s walkout rather than discuss the issues raised was poor form. Perhaps Mo could have respectfully disagreed and explained her view on the apparently high concussion and leg injury rate in the women’s game and how it can be reduced? BTW; I really enjoy the AFLW and dislike the AFL tokenism on the AFLW season and number of games allocated. Malthouse has a strange way of standing by his comments. Each time he’s been questioned since, he’s shifted ground and re-framed his position. To make a judgement of Mo’s reaction, we’d need a better idea of the context of discussion on the day. Frankly, if she was just sick of this whole line of discussion that would be understandable. I believe you are right John, he is reframing to justify his opinion. This is indication of how controversial his words have been which could be seen as a step forward for him. A small step. Yes, Mo would have been distressed and extremely disappointed at the comments. The girls are up against it and their league is in the balance. She and others are working hard to promote the league let alone play in it. So, a Malthouse comment or a poor AFL administrative decision cuts hard. The leadership of Nicole Livingstone is now more and more being questioned. A quiet voice or a more pro-active one? It appears that she is firmly under the screws of the AFL and playing merely an administrative role.